Since 1925, The American Legion has sponsored a nationwide youth baseball program. During these past seven decades, millions of young players have enjoyed playing baseball. The American Legion and their members have raised millions of dollars each year for players to learn the importance of teamwork, discipline, leadership and good sportsmanship. 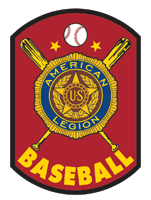 The American Legion sponsors American Legion Baseball to give players an opportunity to develop their skills, personal fitness, leadership qualities and to have fun.